Another view from the Passing Cloud while at anchor in Houston Stewart Channel looking the opposite direction from yesterday’s photo. This view was taken when the low morning sun was just breaking through the mist. That boat is perfectly placed in the frame in the centre of that dark triangle, And then there is that stick-like speck of white (I don’t know what it is) that is, to my eye, so important in the frame. Despite it being so small it provides a balance with the boat. Thanks so much Andy. The speck of white is a channel marker and I agree about the importance – I enhanced that spot a bit when converting the image, and its a good thing because I am finding that WP is mangling my images a bit when I upload and that area lost quite a lot. WP uploads have started making images a touch smaller and I am losing a lot of subtlety on upload as the images are becoming much higher in contrast. In the original it is possible to see that it is a marker, and that it is sitting on a slightly darker rock than than the surroundings. Even so, it still works like this so I am not complaining too loudly. Interesting that you mention some dissatisfaction with images in WP. I hadn’t really noticed until today, and the image just uploaded seems to have lost quite a lot of its original brightness – the whites look really dull. Not sure what’s going on. I have only started noticing it in the past week or two. Something different has happened at WP. I find my images, on upload, lose a bit of size so there is some kind of compression taking place. This is even though I follow rules I discovered a two or three years ago to avoid WP messing with images make my images the size needed for my theme, and keep them small to save storage space. Until recently those methods worked just fine. Wow, another fantastic shot! 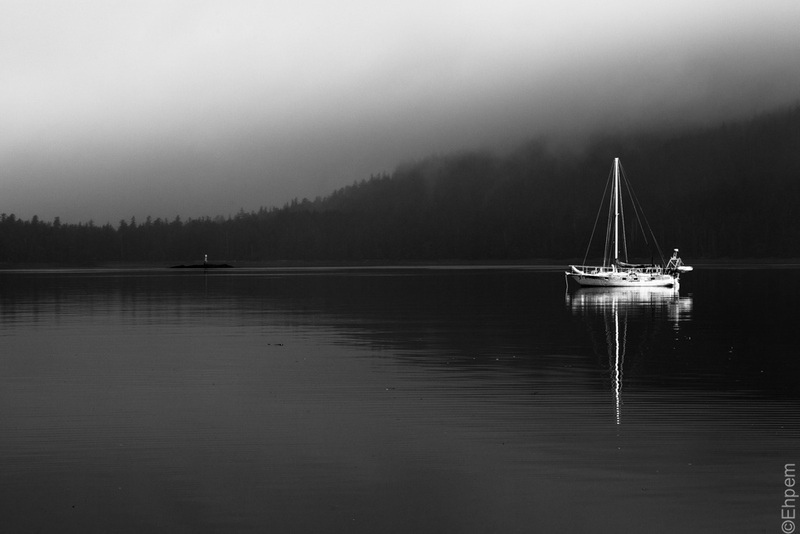 The tonal range from the soft darks to that shining white boat is remarkable.